The weather outside reminded me of a pre-Oz Kansas prairie. However, inside the Katie Brown workshop we have our very own yellow brick road! 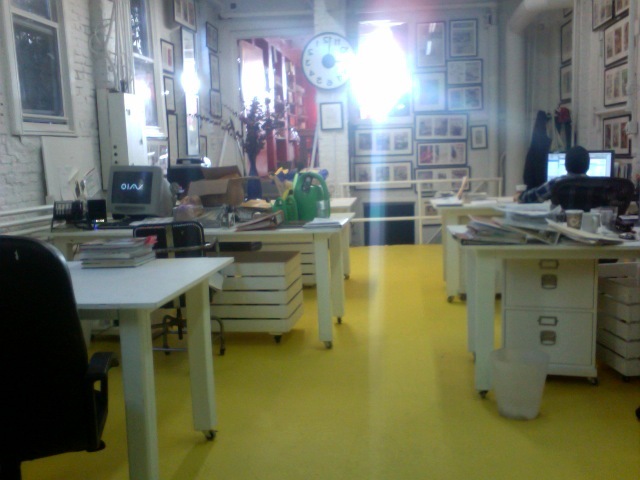 Over the weekend our floor went from dusty grey to daffodil yellow. The blustery wind also blew in two new additions to the Katie Brown Workshop: Laura and …. Laura (Mathews and Curtis). The girls are both joining the culinary team. After introductions, the team sat down to discuss upcoming events including a spot on the Today Show featuring the perfect Super Bowl snacks. Of course, salty, fatty, and finger-licking are the foods of choice for most football fetes. Nachos, pigs-in-a-blanket, chili, and wings all come to my mind. What do you consider the quintessential Super Bowl snack food? More brainstorming, and hopefully more sunny days to come. Can’t wait to watch this show today. Deck the Halls, and the gifts, and the tree… Party Planning!